Did you know that 87% of travellers use the internet when planning their trip? Whether it be searching for flights, reading up on a destination or finding reviews on possible accommodation. This shows how important it is for travel professionals to use Social Media platforms for marketing their travel services – even if you activity to another company – letting them build a community for you. How would you, as a travel professional, go about using social media to market your business? Identifying your specific target audience. Engaging with the right people on your chosen Social Media platforms. Most of the time, the target audience for a travel company will be quite broad – with customers falling into many of the different traveller categories – if not all of them. In this case, we recommend that you curate marketing content that will appeal to all categories. However, focusing on a destination when you are looking to hard-sell it. Many companies make the mistake of building a large online community and randomly boosting posted content to audiences that don’t meet any of the necessary segmentation criteria. To avoid this, we recommend that you run paid adverts on Facebook that looks to target your specifically segmented target audience using the criteria that you have laid out. Stop you from wasting time and energy posting to a group of people that don’t want to see your content. Keep the right audience engaged and aware – helping with the top-of-mind objective that every company wants to accomplish. Save your company money as your posts are not targeted to random audiences. How would your customers rate their experience with you and on their trip? That is a question that every travel company should ask themselves, and having platforms that allow customers to voice their opinions about their experience is imperative to creating a strong brand. Luckily, Social Media provides platforms for people to do just that. Travel companies should be listing themselves on the following platforms and encouraging their customers to share their experiences on their travel/accommodation/activities. Encourage customers to share their experiences by featuring them on the blog. Assist with the SEO ranking of your company. Showcasing destinations with easy-to-read content – giving your potential customers a quick overview of a destination without them having to search your site for it. Signing people up to receive emails about your latest blogs – ensuring that they are repeat users of your site. Creating a community and building relationships with customers and keen travellers. The “travel blogger” job description seems to be one that more and more people are looking to secure. Allowing them to be sent all over the world travelling to many different places and writing about them. As a travel company, this is a great way to get your brand name out there as these people are seen as “influencers” among keen travellers – who, in theory, take most of what these influencers say as the absolute truth – giving you a great opportunity to showcase your company. How do you attract these influencers? The easiest way to do so is to offer them a free trip to one of the destinations you offer in exchange for them showcasing your company on their blog and social media platforms they are on. Travel is the most commonly talked about topic online as there are so many people asking for opinions and advice for their next holiday. If you can find and be part of these conversations, offering your expertise and experience, building your brand name could not come much easier. Did you know that images and video content attract almost 3 times more engagement than ordinary posts? 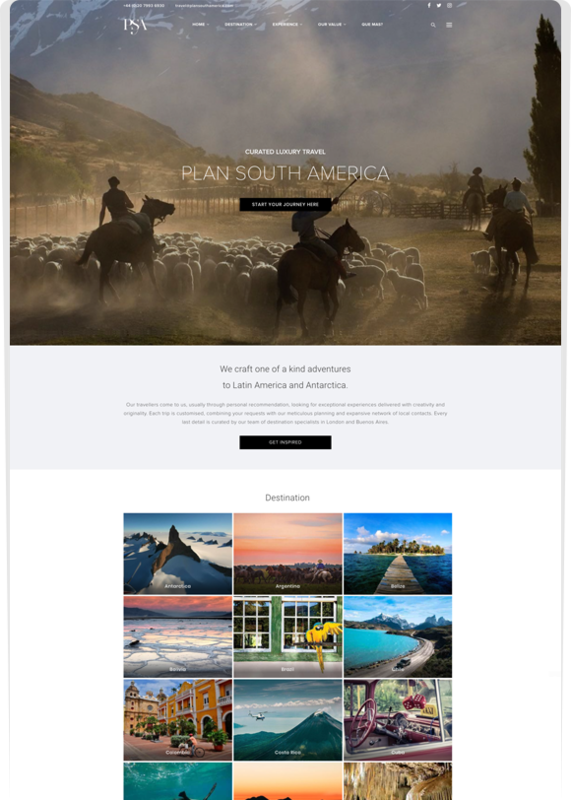 Incorporating dreamy images of the destinations you offer and showcasing them on your site and social media platforms. Using images and videos that your clients have sent you and showcasing them on the same platforms – ensuring credibility and building a relationship with your clients. Visual posts such as these will encourage your followers to share them with their fans and followers – leaving them desperate for more. Responding to your audience and clients is one of the most important ways to build and maintain a strong relationship with them. Be sure to respond to questions, direct messages, comments and mentions as quickly as possible – Keeping up good interactions will give you a good reputation – and word-of-mouth is a major factor in a company’s success or their downfall. Now that you have read our crash-course in marketing for your travel company, head over to our website and let us help you build your business.